Home / Data Privacy / How can I use Helpshift to manage inquiries from end users related to data privacy? We understand that personal digital privacy is important to you and your end users. You can use many of our existing features to handle and address inquiries from your end users related to the privacy of their data. To provide a stable source of data privacy information that is easily searchable for your users, create new FAQs that address their concerns. You may wish to place these FAQs under a new section that is specific to this topic, such as ‘Privacy and Security’ to make it easier to find. Once your new FAQs have been published, set up the Answer Bot for your in-app and Web Chat experience to automatically suggest these FAQs to users in response to questions about private data. This will make it even easier for them to find this information. To give your users the option to reach out about data privacy from those specific pages, you can add a custom ‘contact us’ button specifically for privacy inquiries. For example, if you have a privacy page or a set of privacy-related FAQs within your app, this button could be titled ‘I have a privacy question’. You can have the button set to automatically add a Custom Issue Field or tag related to privacy so it can be routed correctly. To set up a custom ‘contact us’ button within your app, see our developer documentation for iOS and Android. Alternatively, if you’d like to provide buttons that can only be used to initiate specific privacy requests but that do not involve having a conversation with a user, such ‘Request a copy of my data’ or ‘Remove my account and all related data’, you can do so by configuring our REST API. To learn mow, see our developer documentation for our REST API custom contact us form options. For your web users, you can set up a specific Web Chat widget just for your privacy pages. This widget can be configured to automatically classify all new Issues as privacy related by adding a tag or Custom Issue Field to new Issues generated by that Web Chat widget. To set this up, see our developer documentation for Web Chat on tracking. You can also customize your Web Support Portal contact us form to have an option that allows the user to indicate that their inquiry is related to data privacy, such as offering a ‘reason for reaching out’ field. 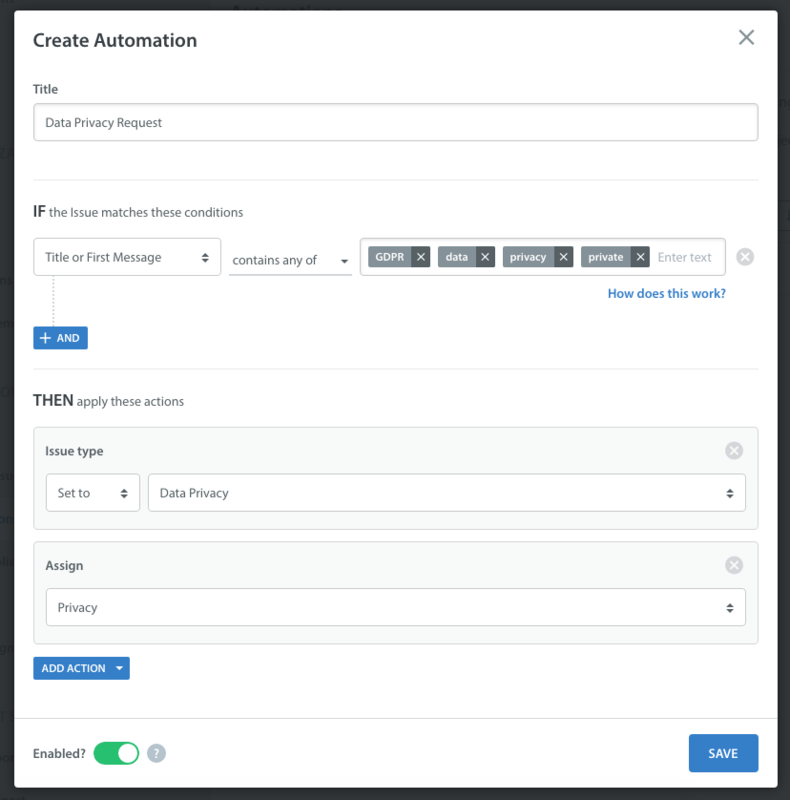 If the end user selects the data privacy option, it you can set up your workflow to automatically route this Issue to the right place by adding Custom Data that will be converted to a Custom Issue Field or tag. If you are already using your own web support portal, you can integrate this with Helpshift using the HSAPI to ensure that all new email Issues related to data privacy are appropriately categorized. To learn more, see our developer documentation on custom solutions for the web contact us form. When your users decide to reach out directly to your support team with their privacy concerns, you can use our workflow management tools to automatically classify and route these Issues. Our AI-powered engine, SensAI Predict can be leveraged to classify Issues based on the content of the user’s first message. Predict can be trained with a set of privacy Issues to analyze all incoming inquiries and identify specific privacy-related requests. It can also be trained to differentiate between different types of requests, such as ‘Can I get a copy of my private data’, or ‘Please remove me from your system’. Please note: SensAI Predict is an add-on feature that must be unlocked with an account upgrade. Contact your Account Manager or to success@helpshift.com to learn more. To use Automations to automatically prioritize Issues, set up a New Issue Automation to check the title or content of the first message for data privacy-related keywords. For example, if they use the keyword ‘private’, you can have the Automation set up a Custom Issue Field so that the Issue is correctly filtered into the relevant Smart View, or assigned to the correct Agent, Queue, or Agent Group. Once your data privacy Issues have been appropriately classified and routed, your support team will need to follow up on these Issues. The following tools can be used to set expectations for end users about when they’ll hear back, provide templated responses for your Agents to reference and send to end users, and complete additional custom actions. You can set up FAQ suggestions, which will suggest content from existing unpublished and published FAQs that your Agents can use to to reply to end users. You can also create Quick Replies as responses to common data privacy questions or requests. 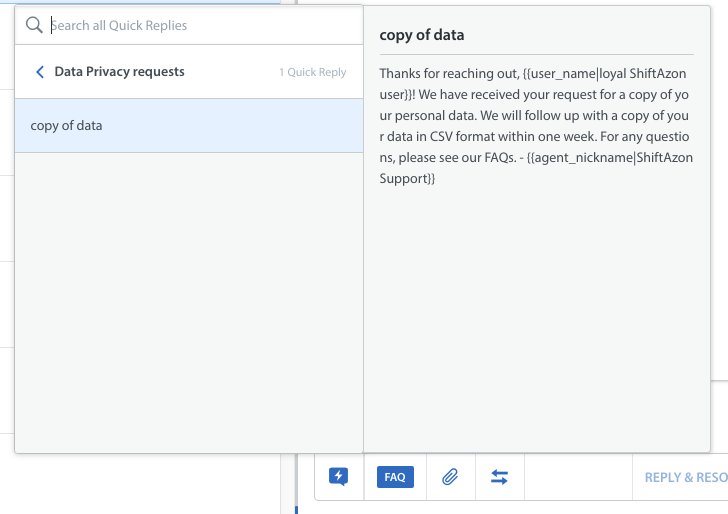 You can also set up a webhook to trigger a custom action per request, such as a click on the ‘Provide a copy of my data’ custom button that you learned how to set up above. This can be done by setting up Custom Issue Fields to trigger a webhook. To learn how, see our guide to Webhooks for Custom Issue Fields.